The Old Dairy is a refurbished and beautifully presented stone "barn" that sits on the hillside just above the harbour in St Mawes. The kitchen is very well equipped and was spotlessly clean, with a large dining table great for lunch after a visit to the beach or dinner in the evening. Similarly the bedrooms and bathroom were very clean and nicely presented with lots of small touches. We had a wonderful time, whether it was exploring the surrounding area or just going down to the harbour to swim, and the Old Dairy was perfect for us. One tip - forget using the car and buy a week pass for the local network of ferries. These run like clockwork and connect St Mawes with Falmouth, the tip of the Roseland peninsula, Trelissick and even Truro. 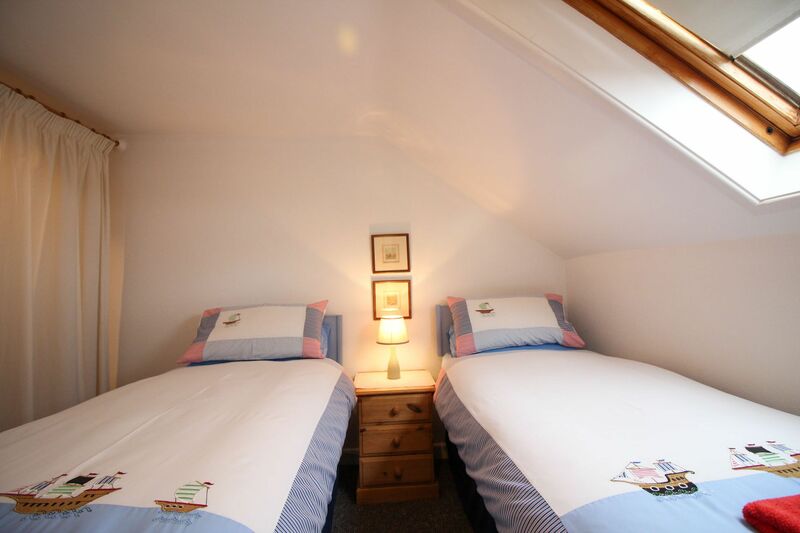 St Mawes is a great location for a family holiday and The Old Dairy is a very comfortable place to stay. The Old Dairy was very beautiful and had most things one would need for a short stay. It was cosy and comfortable. The kitchen was equipped with most cooking utensils and cutlery. Plenty of plates and a few cookware for the oven and saucepans. There was a very small fridge with ice box that fitted on the work top. There was a dishwasher, washing machine and tumble dryer. The small amount of room out the kitchen was utilised to the max. The kitchen was clean and organised. A large table and six chairs to sit at meal times which was adorned with a few layers of heat and spill resistant tablecloths. The Kitchen had a wicker basket with lots of local tourist information. Which was useful. The whole cottage was very clean. The living room was comfy and had basic tv and small radio cd unit. It was very quaintly decorated throughout the cottage nice seaside pictures and ornaments that reflected its surroundings. The bathroom was small and the shower a bit of a trial as it was really a tap shower for the bath hung upon the wall. Hot water came on at certain times and could go cold quite quick I had a few warmish baths. The skylights in the bedroom were great for stargazing in the comfort of one's bed. I and my husband put the twins together and gave up the master room; far better, to my brother and sister in law. We loved the log fire but ran out of logs pretty quick. but we were able to purchase logs from the coop down the hill; the very steep hill! lol. The week went so quick and at least we had some sunshine to enjoy the seating area outside with our dog Willow. We brought plenty of ground sheets to cover the floor downstairs as Willow is a big Alaskan Malamute which locals got to know very well. We did not want to go home at all. The hosepipe was great for washing the sea water from Willow too! We left it as we found it - Clean and tidy. We hope to visit again! Would benefit from the parking space being concrete .twice I slipped on the large wet gravel getting out of the car.apartfrom this the cottage was very well equipped ,warm,and cosy and convenient for the shopping area and restaurants.my dog Paisley liked it to. 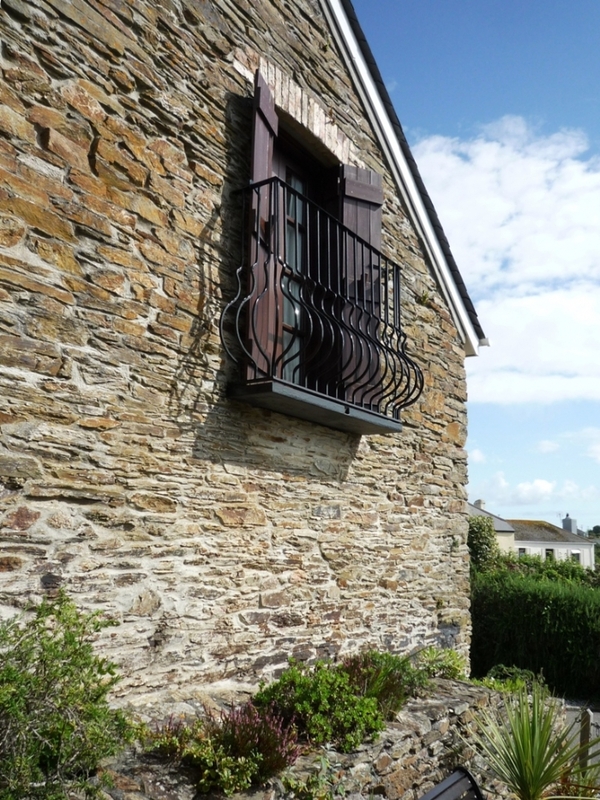 The Old Dairy is well located and provides an excellent base whether you simply want to have a week in St Mawes or, if you want to explore Cornwall in general. 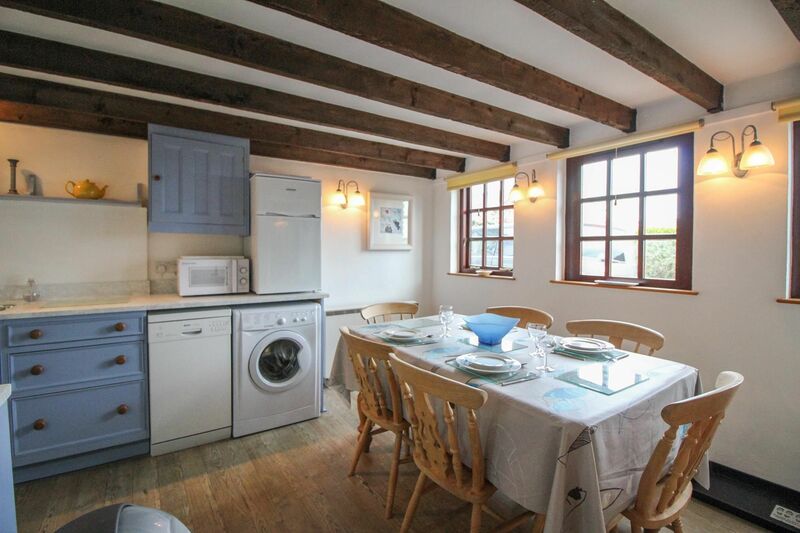 The cottage is spotlessly clean & very homely. It is tastefully furnished and very well equipped. Would highly recommend. 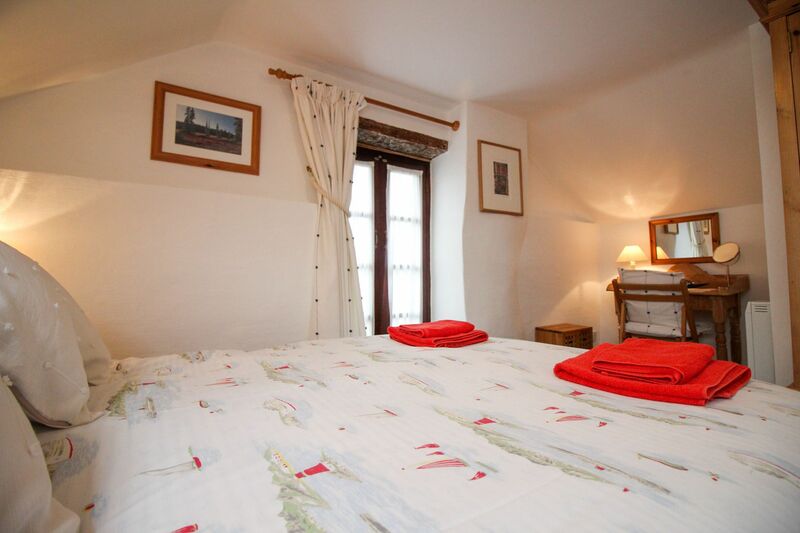 The Old Dairy is situated at the top of the village, beautiful and tastefully decorated throughout. With the added advantage of a parking place adjacent to the property. Which is very rare in any Cornwall fishing village. The owners have thought of every home comfort. The only slight downside is no wifi. Though the owners mentioned that they maybe looking into providing this in the near future. Beautiful area with lovely walks. A visit to St Just church is a must do. We were so lucky with the weather which had the 'summer' heatwave. With the colour of the sea and all the tropical plants that grow because of the micro climate it was like being abroad. I would not hesitate to highly recommend this property. The upstairs doors needed attention ie. the bathroom door was impossible to open from the inside when shut. The only way was to get help from the outside. The Dishwasher needed a cleaning agent as it smelt. 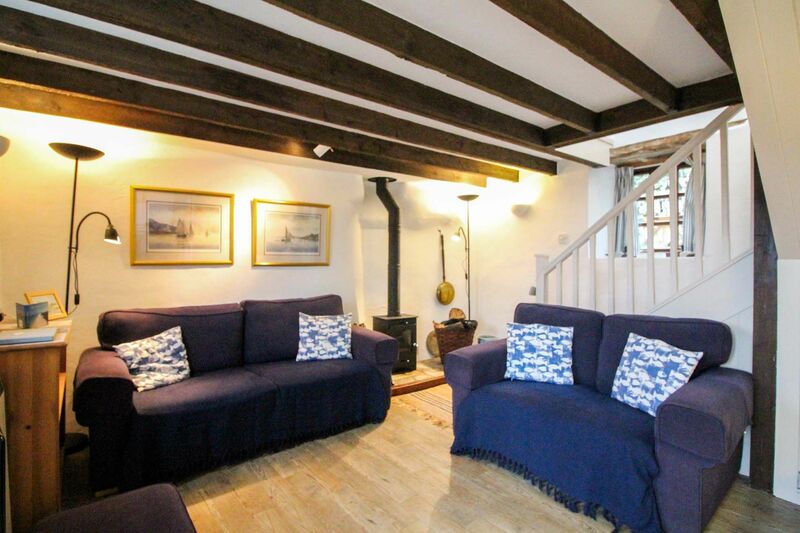 The Old Dairy in St Mawes is everything what you expect from a holiday cottage. It was very cosy, clean, and felt at home from the moment we entered the cottage. Yes, there is a steep climb from the harbour, but then you loose some calories that the good food en drinks have supplied. Nice walks in and around St Mawes. I did not need the car the first days, use the ferries, or walk straight from the cottage into several directions, all with great views and well marked paths. We loved our stay in St Mawes, The Old Dairy. We had a great time in St Mawes staying at this delightful cottage. It was cosy, well equiped, clean and very well situated being just a few minutes walk to the harbour. 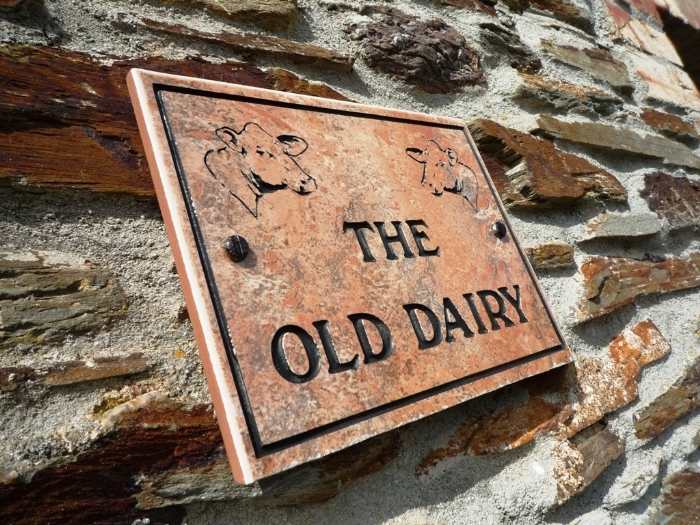 We have stayed at the Old Dairy five or six times over the last ten years and have always thoroughly enjoyed our stay. My only moan on this occasion is that a number of the internal doors don't close properly-a little planing needed here and there. Could recycling facilities be provided? we were surprised that this was not required. If, boxes were in situ, it would not take much time for the caretakers to transport to the recycling bins on the carpark. A really nice 7 day break, cottage was warm & comfortable as usual. The only problem seemed to be with the kitchen taps. When the shower was activated in the bathroom the taps in the kitchen seemed to run! You had to turn them off very tightly. Other than that everything was great. 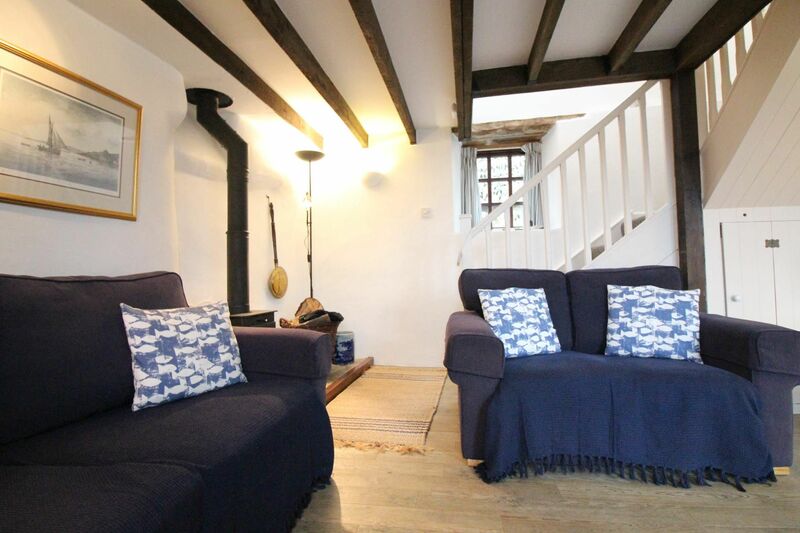 If you bring your dog,this cottage backs onto National Trust land for walks. The cottage was cosy with everything we needed for an enjoyable stay. The cottage is at the top of a very steep hill but is convenient for driving to the surrounding area. We found St Mawes to be very picturesque but with limited dining venues and rather quiet for September. The Cream Tea at St Just in Roseland (Miss V's hut) was fabulous. The Rising Sun keeps good Ale and was a lovely place to unwind after a day out looking towards the harbour. All in all a very enjoyable relaxed week. 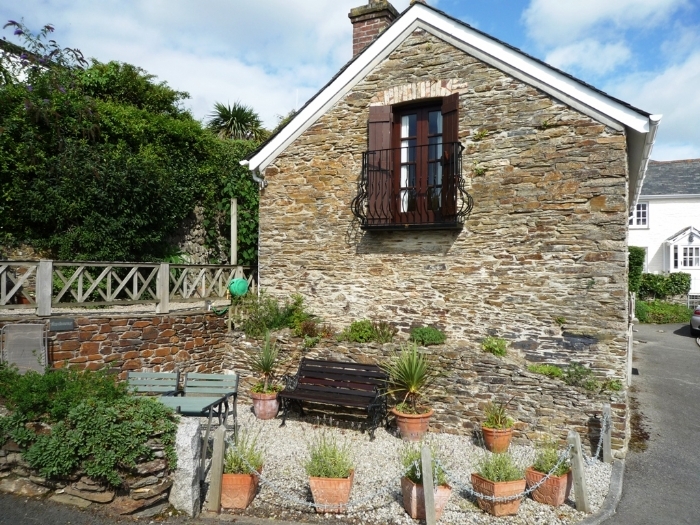 Cottage is in a good location close to St mawes,but be warned there is a steep hill down to the village. Cottage is small and a little tired for price we paid. We were at end of season and it could do with a deep clean under beds and behind sofas etc A little update of towels crockery bedroom furniture etc would really improve the property. 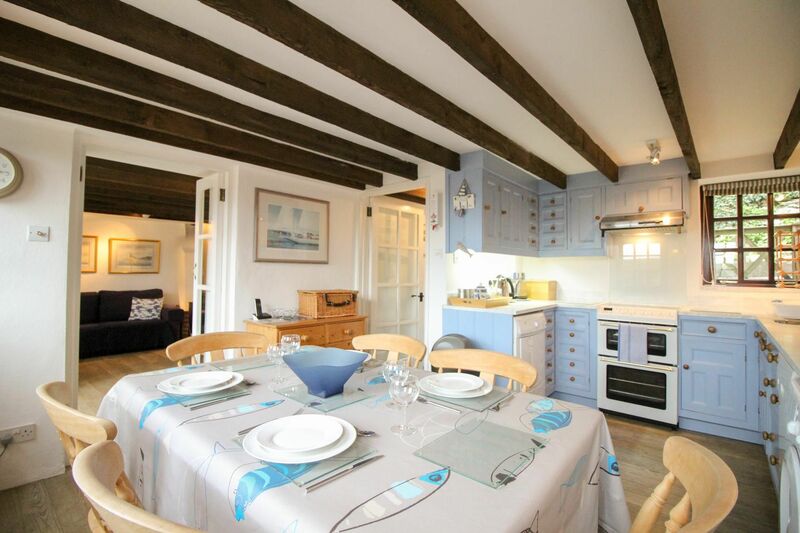 But that said it is well equipped and the location is stunning (Cornwall/St mawes). Plug hole in bath had plug of hair in it. Wash hand basin was dirty. Cooker hobb and controls were very greasy. We had difficulty with the fridge door opening and closing. Oil cloth kitchen table cloth had dried up jam or tomato sauce on it. These are all things we cleaned ourselves. Washer on hot water taps in kitchen and bathroom wash hand basin were defective, we had to turn them off very firmly to stop them dripping. We have stayed at the Old Dairy on four previous occasions and had absolutely no concerns. It might be good idea to warn people about the steep climb up from the harbour. Besides this the location was ideal. The cottage was very comfortable. With no mobile signal or wifi, a wonderful week of uninterrupted relaxation. The Old Dairy is a great property and an ideal base for exploring the Roseland. Situated at the top of a steep hill, the 5 minute walk to St Mawes is far easier than the walk back but as with most things in Cornwall, there's no rush. St Mawes itself was a mixed bag with surprisingly very few Cornish locals. Walking along the quay you'd be forgiven for thinking you were in Henley on Thames rather than a Cornish fishing village such is the influx of the haves and have yachts to the area. Look past this material veneer however and the sheer beauty of the Roseland is unquestionable. Branch out into the surrounding villages and towns for a more authentic experience and you won't be disappointed. Lovely comfortable cottage with great facilities. 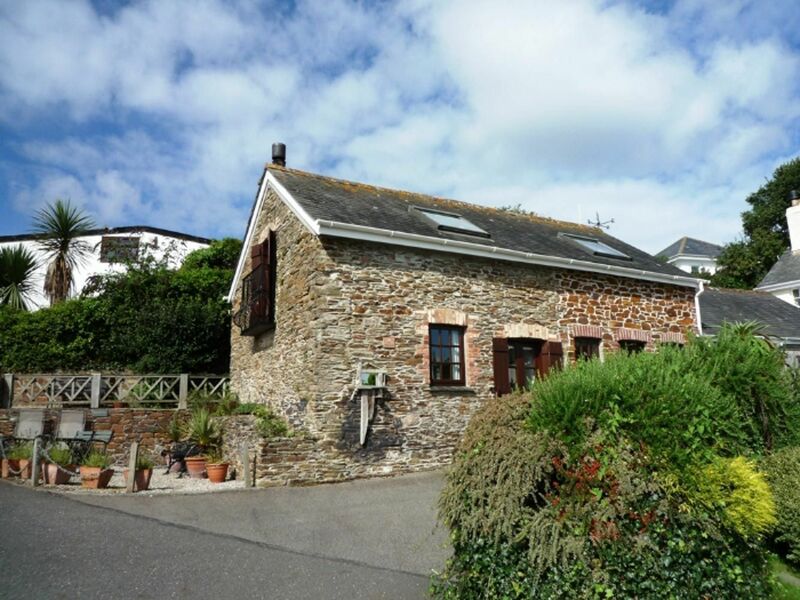 Quiet location is excellent, with only a short walk to the picturesque St Mawes Harbour and small friendly town. The area has very steep parts for walking so this must be considered when booking if have special requirements. Lovely cottage. Good position up the hill from the sea front. Keeps you fit walking back up ! 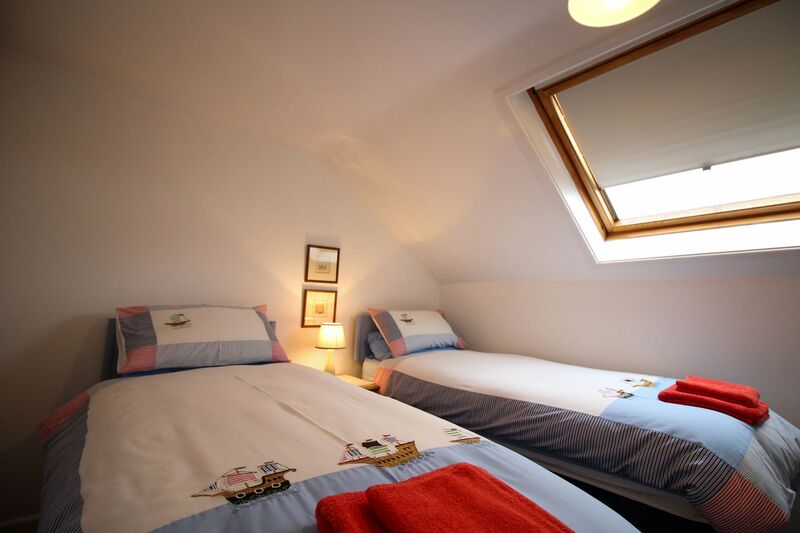 All rooms very thoughtfully decorated and furnished. Very high quality throughout. Very relaxing. Extremely well equipped. Very clean and pleasant. Plenty of lovely walks and places to drive to & explore. Would recommend to anyone. Will return as soon as we can. Really enjoyed our stay again at The Old Dairy Thankyou. Appreciated all the tourist information. 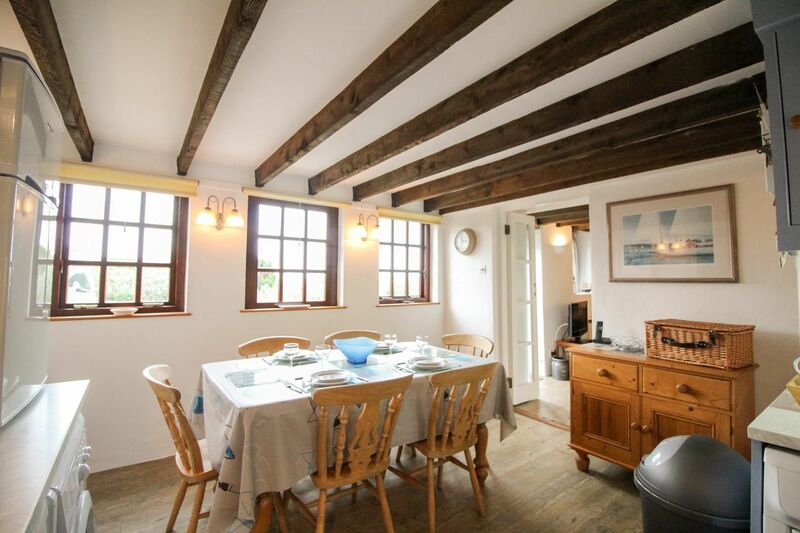 We love this part of Cornwall and the house is very cosy and close to the main toen. 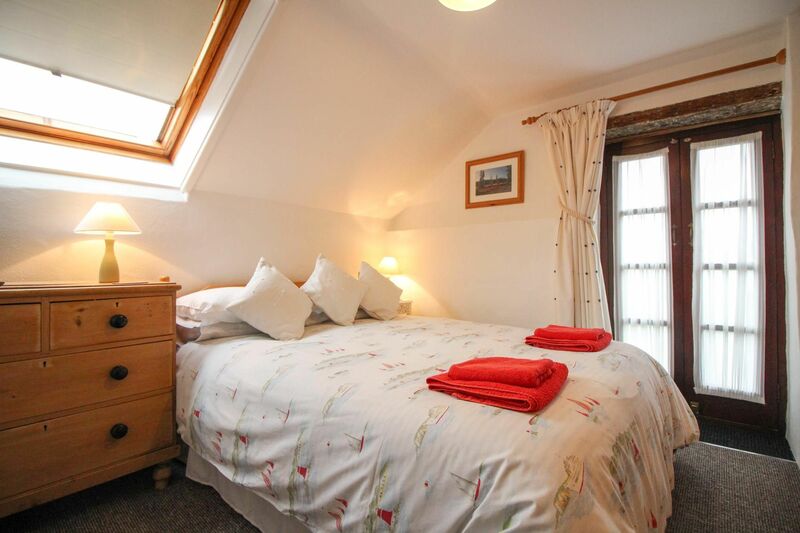 We are frequent visitors to the Roseland and this property is one of the nicest we have stayed in. It was spotlessly clean throughout. The kitchen was well stocked with everything needed for our stay and a welcoming bottle of milk in the fridge on arrival. (a nice touch). There are lovely finishing touches throughout the cottage which made us feel comfortable and at home. We had a lovely holiday at The Old Dairy and loved St Mawes and the surrounding area and found it very dog friendly. I would recommend The Old Dairy and St Mawes and would most definitely book it again. The Old Dairy was lovely, great location! 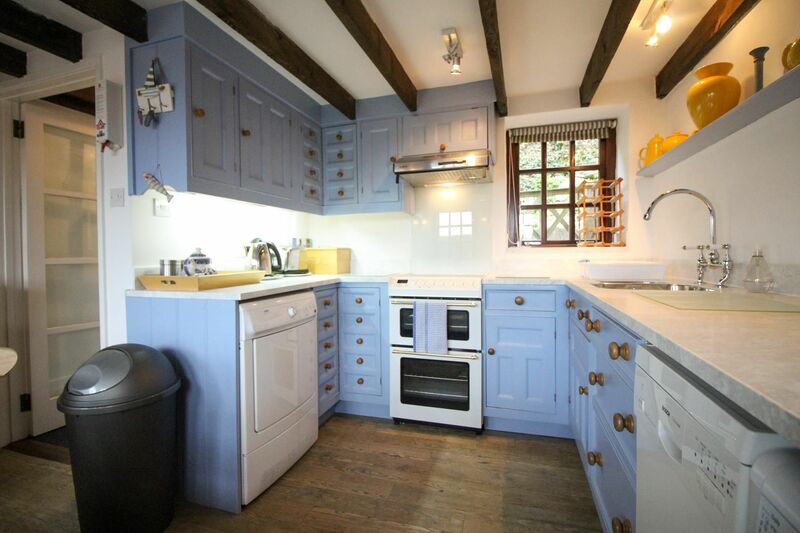 Very tastefully decorated and to a high standard. We were very impressed with the online booking service.......an excellent site. The Old Dairy was in an super location for our walking holiday - it was clean and the decor tastefull. I would not hesitate to recommend it to friends. We were impressed by how clean and well equipped the Old Dairy was and had an enjoyable holiday. This is our 6th visit to Cornwall and we have stayed somewhere different each time.This has to be the best cottage by far though the hill is a little challenging!! Superb cottage..a great part of the world...recommended. Our fourth September at The Old Dairy and thoroughly enjoyed it yet again. Hope to return next year. A wonderful return to The Old Dairy. We have had a fabulous week in this relaxing comfortable cottage.Cant wait to come back. 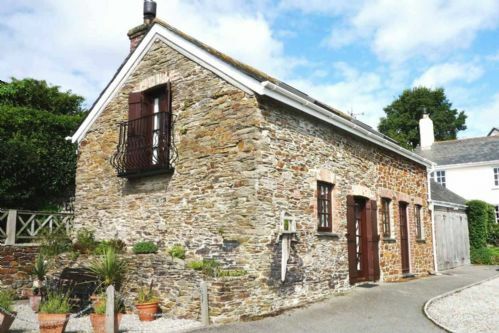 The Old Dairy is an immaculately presented conversion of this former farm building located in quiet part of the picturesque harbour village of St Mawes. It is positioned a short walk up a steep hill from the harbour, which is always a wonderful place to watch the boats come & go. The beaches of Tavern or Summers are only a little further to walk or you can catch the little ferry to Place Manor for superb coastal walks or some wild sandy beaches. There are also some excellent walks to be had from the property itself to St Mawes Castle and along the coast to St Just in Roseland with some great views across the water. 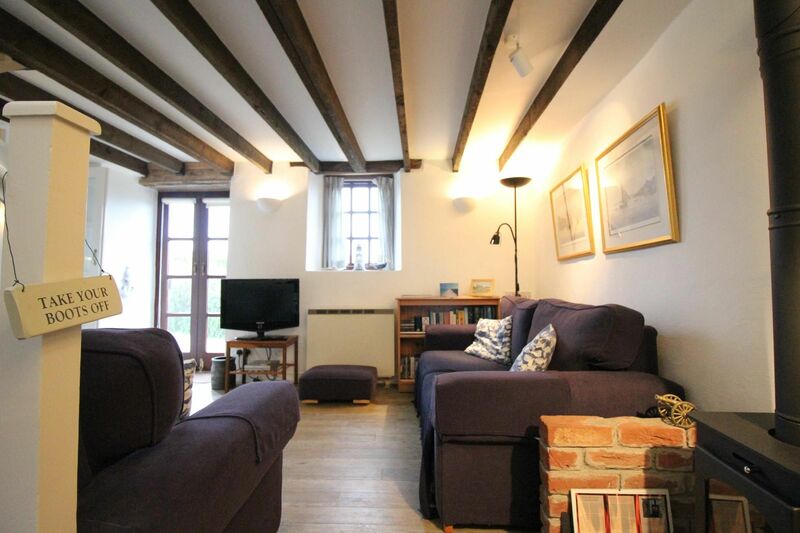 This well thought out holiday cottage is full of character with a heavily beamed ceiling in both the kitchen and lounge areas and it has a wood burning stove to keep you nice & cosy during the colder months of the year. There is superb Amtico flooring throughout the ground floor. The kitchen is well fitted and there is a good sized dining table. 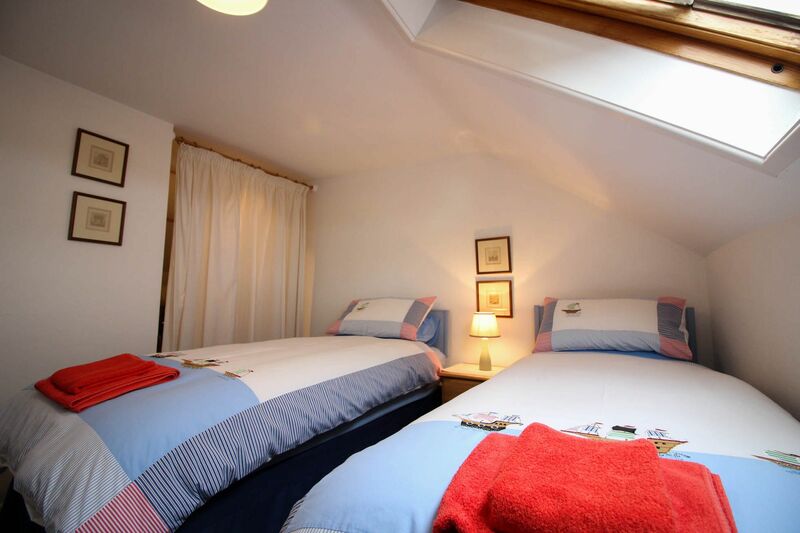 The main double bedroom has a lovely little juliet balcony and is light & airy. 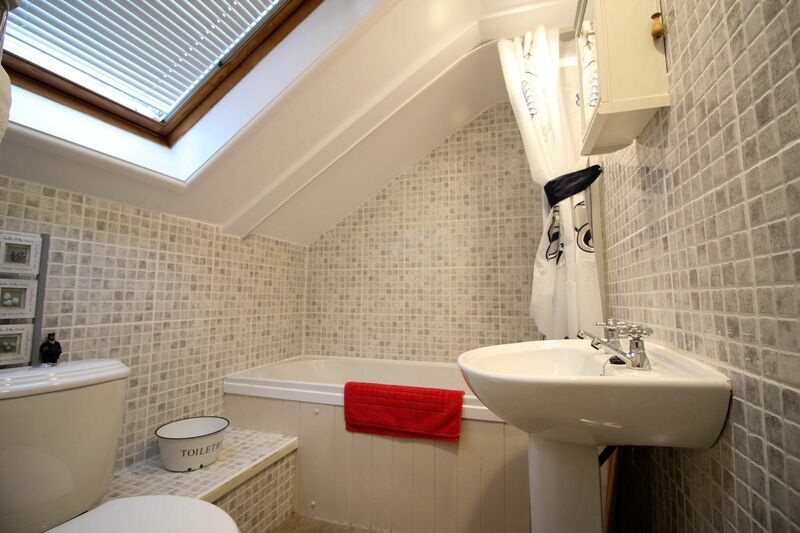 There is plenty of storage space in both bedrooms & the bathroom has lovely limestone tiling. Ground Floor: Entrance porch leads through to the kitchen / diner area. 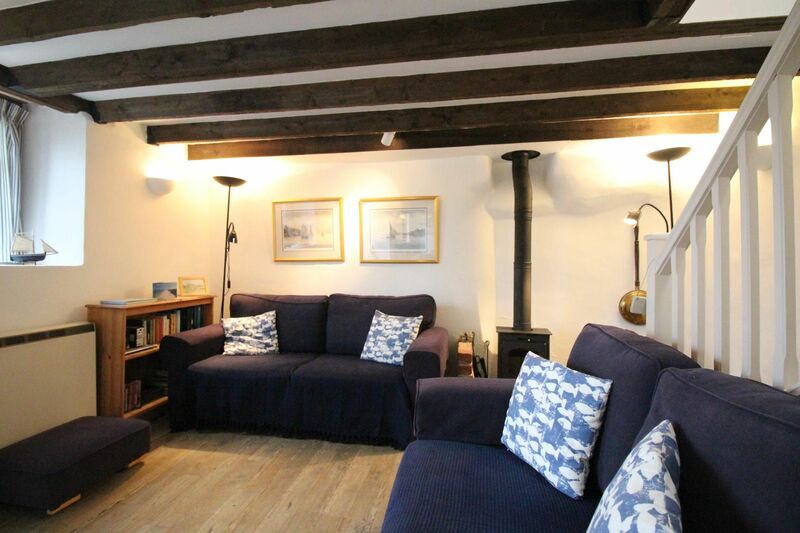 The lounge has 2 comfortable sofas and the wood burner and the stairs to the 1st floor. 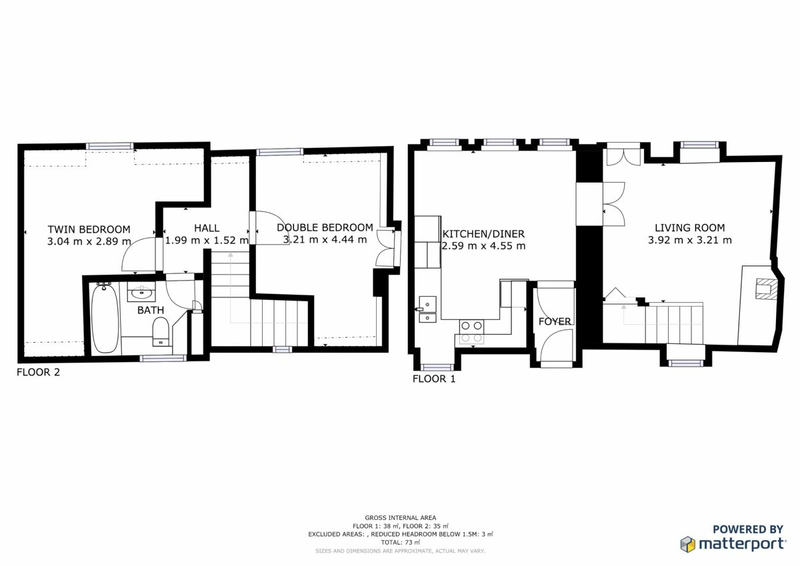 First Floor: The double bedroom with juliet balcony and TV, family bathroom with over bath shower & WC, twin bedroom. Exterior: There is a small gravelled sitting out area to the front of the property, with a further raised area with a wooden bench. 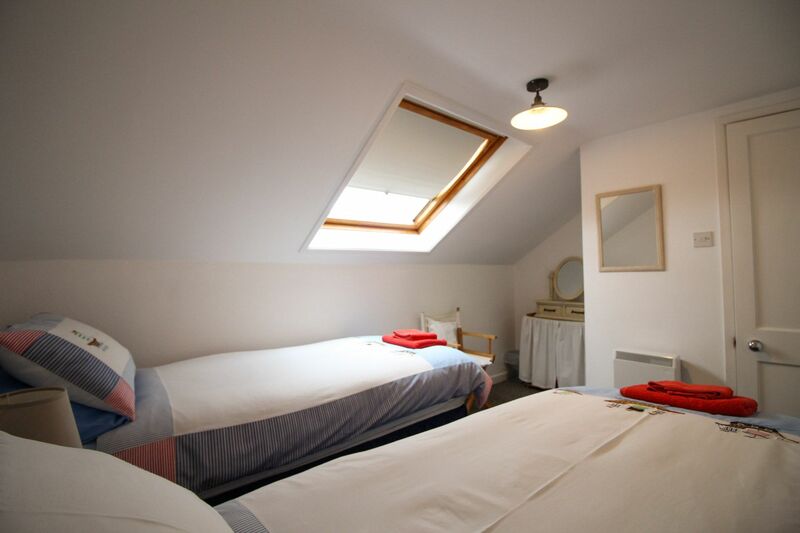 Heating is via night storage heaters on the ground floor, the wood burning stove and panel heaters in the bedrooms. There is a TV/DVD & stereo in the lounge. The kitchen has a fridge / freezer, electric oven & hob, washing machine, tumble dryer, slimline dishwasher & microwave. 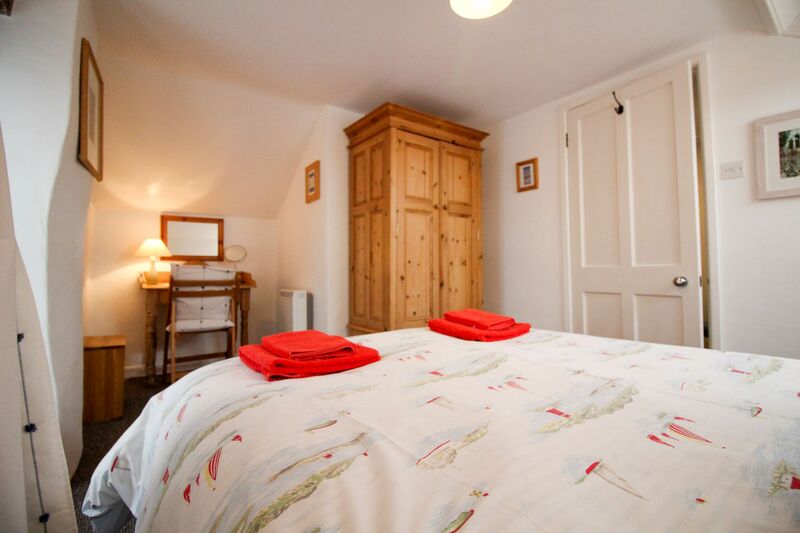 Electricity, bed linen & towels are all included, but you will need to provide your own beach towels. There is a large dedicated parking space opposite the property. One well behaved dog is welcome at a small additional cost of £25 per week, although please remember that you cannot leave your dog unattended in the cottage alone. We regret no smoking is permitted. Free WiFi is available. There is a cot and high chair available at The Old Dairy.